To start this article by saying I am perplexed is an understatement. It only takes a split second of contemplation to realize that something is wrong. Maybe it is the fact that words “integrity” and “ministry” are seldom used in the same sentence anymore. Maybe it is the fact that our television ministers stress far too much on “giving” your way to a miracle rather than “living” your way to one. Maybe it is the fact that I recently had a disciple warned not to stress a strong, biblical male presence in the home because it does not fit with social norms in the situation he is currently involved in. Maybe it is the reality that the “feel” of Babylon and Egypt is all around us and Zion is a fleeting memory. If you don’t know what I am talking about, then I am not writing to you. I am writing to those that yearn to see the true Kingdom of God expand and for hearts to burn with a holy passion for God and a love for the Word of God, justice and the transformation of mankind. I want the fire of true, biblical revival – not the razzle-dazzle of emotional hype. I am tired of seeing services where we “party” all night (for Jesus) and there is no hunger for the Word or hearts broken over sin. 10 And try to learn [in your experience] what is pleasing to the Lord [let your lives be constant proofs of what is most acceptable to Him]. 11 Take no part in and have no fellowship with the fruitless deeds and enterprises of darkness, but instead [let your lives be so in contrast as to] expose and reprove and convict them. 12 For it is a shame even to speak of or mention the things that [such people] practice in secret. 13 But when anything is exposed and reproved by the light, it is made visible and clear; and where everything is visible and clear there is light. 14 Therefore He says, Awake, O sleeper, and arise from the dead, and Christ shall shine (make day dawn) upon you and give you light. 15 Look carefully then how you walk! Live purposefully and worthily and accurately, not as the unwise and witless, but as wise (sensible, intelligent people), 16 Making the very most of the time [buying up each opportunity], because the days are evil. Those of you that are preachers should be able to take these powerful verses from the Amplified Bible and develop an entire series from them. I could write a book around them and not even touch on where I really want to go here. The point that I am trying to make is that the way we are doing things is more “grey” than “light.” The result is that “we” are the sleepers needing to rise from near spiritual death and do not even know it! If there was ever a Laodicean Church, it is in America today. If your heart is agreeing with me, then the question needs to be asked: “How can we change this?” First and foremost, it must change with us personally and the change must be within! 20 And when he was demanded of the Pharisees, when the kingdom of God should come, he answered them and said, The kingdom of God cometh not with observation: 21 Neither shall they say, Lo here! or, lo there! for, behold, the kingdom of God is within you. The local students that just completed my new class on “the Leader of One” know where I am headed with this. To change the world, I first must be changed. The Kingdom needs to be established and expanded within me and my life. Until I do that, nothing in the world around me will ever really change! Each one of us needs to start crying out for God to change us. We need Him to change us in whatever way He desires to fulfill His will and destiny around us. This cry is not for our benefit, but for the hurting, dying world around us. If we cannot cry out for Him to change us, then how can we ever expect Him to change the world! It is time to pick back up the Cross and follow Him! 19 Then came the disciples to Jesus apart, and said, Why could not we cast him out? 20 And Jesus said unto them, Because of your unbelief: for verily I say unto you, If ye have faith as a grain of mustard seed, ye shall say unto this mountain, Remove hence to yonder place; and it shall remove; and nothing shall be impossible unto you. 21Howbeit this kind goeth not out but by prayer and fasting. In the Laodicean environment of today, the change will not be easy. It will be like that demon that the disciples of Jesus could not cast out. It will not go quietly into the night. From what we can learn from Matthew 17, our faith will require more than just speaking to the mountain. Speaking will work for many things, but there is a time that MORE is required of us. That time is now. It will require a crucified lifestyle of fasting and prayer! 17 Because thou sayest, I am rich, and increased with goods, and have need of nothing; and knowest not that thou art wretched, and miserable, and poor, and blind, and naked: 18 I counsel thee to buy of me gold tried in the fire, that thou mayest be rich; and white raiment, that thou mayest be clothed, and that the shame of thy nakedness do not appear; and anoint thine eyes with eyesalve, that thou mayest see. 19 As many as I love, I rebuke and chasten: be zealous therefore, and repent. 20 Behold, I stand at the door, and knock: if any man hear my voice, and open the door, I will come in to him, and will sup with him, and he with me. We have trusted in our wealth and affluence rather than in the God of Abraham, Isaac and Jacob. We have so much physically that we do not realise that we have so little spiritually! The good news is that Jesus is counseling us today to change our priorities. We must become Kingdom of God oriented, not personal Kingdom centered. The last part of these verses is used so many times to call the lost into the Kingdom. Originally it was not given for that. This call was given to the Church. I have also heard ministers use these verses to show what bad shape the Church is really in – Jesus is on the outside knocking to get back in. Although there is much truth in that statement, I do not believe that is what is being conveyed here. 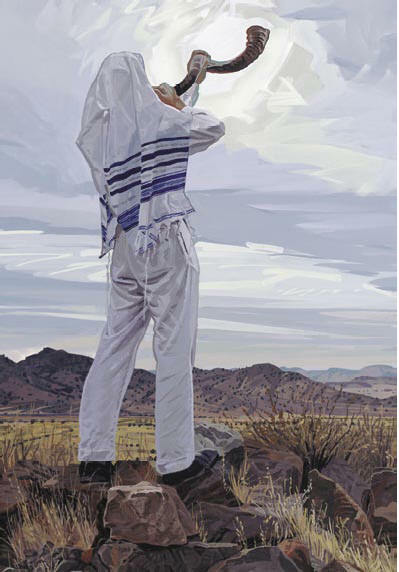 The reason we do not get the full picture is because we are so far removed from our Hebraic (Jewish) roots. In Scripture there are four different types of covenant in the Word of God. I do not have time to get into all of them, but I will introduce them to you. Blood Covenant: A Covenant of Servanthood. Salt Covenant: A Covenant of Friendship. Sandal Covenant: A Covenant of Inheritance. Marriage Covenant: The greatest and most intimate covenant. Starting with Abraham and culminating in Jesus, we have the blood covenant. We are brought into covenant with Almighty God and are His servants in the earth. 14 Ye are my friends, if ye do whatsoever I command you. 15 Henceforth I call you not servants; for the servant knoweth not what his lord doeth: but I have called you friends; for all things that I have heard of my Father I have made known unto you. Because they paid the price to do WHATSOEVER Jesus commanded, they are brought to the friendship level. May I submit that few are willing to do that today in America. The fathers of both families have been talking and feel that the marriage is in order. On the appointed day the father and the “would-be” bridegroom go to the girl’s home and knock on the door. The girl and her father are on the other side of the door and hear the knocking. If the girl opens the door, then she is saying that she wants to take the relationship with this young man to the next level. She wants to become his bride. Once the young man and his father enter the home, both families sit down at the table and begin hashing out the marriage covenant. Most of it deals on two levels: (1) what the bridegroom has prepared (or will prepare) for the bride and (2) all the changing the bride must do to bring herself in line with what the bridegroom feels his destiny in the earth is. Once the agreement has been reached, the bridegroom goes off to prepare a place for the bride (sound familiar). But it does not stop there. Now the bride must change her life and learn whatever she needs to learn to align herself with the bridegroom. To become the wife, she must prepare herself with whatever mental, spiritual and physical skills she will need to stand by his side and be a real helpmeet for him. We have been so worried about Jesus preparing a place for us and have spent our days daydreaming about what it will be like that we have not prepared ourselves to become His wife! We need to be willing to change whatever we need to change, learn and develop whatever we need in order to stand with him. Have we taken up that responsibility? Have we truly entered into becoming the Bride of Christ and started preparing to become a wife worthy of Him? This is the call that Jesus is giving to the Laodicean Church. He loves us and He is rebuking our lack on true preparation. Now He is telling us to be zealous and repent (do an about face and start the true preparation). This is only going to happen through true repentance, prayer and fasting – enough of the “just” speaking about it. It is time to roll up our sleeves and get to work. On our KIB Podcast, I have posted in session entitled “A Call to a Life of Fasting.” Here is what I need for you to do. Go to http://traffic.libsyn.com/biblicallife/BLDW_-_Episode_5.mp3 and download this message. Take the time get the message deep into your heart. If you do not have the Internet, write our office and we will mail you out a tape free of charge. Next, I am calling every student, graduate and friend of this ministry to begin fasting with us every Thursday. (Even if you are just looking to continue your education and are not a BLCS student, start fasting and God will show you where to go for your preparation!) There is instruction in the message on how to start and what to do. If you are a pastor, preach this message to your congregation and call them to fasting. It is time to rally the troops and put action to our beliefs. 19 And Jesus said unto them, Can the children of the bridechamber fast, while the bridegroom is with them? as long as they have the bridegroom with them, they cannot fast. 20 But the days will come, when the bridegroom shall be taken away from them, and then shall they fast in those days. As long as we are on this earth, we should be fasting as a part of our lifestyle. Therefore I am looking for a commitment that is not for a month, or six months or even a year. I am talking about the rest of our lives here upon the earth. 7 Let us be glad and rejoice, and give honour to him: for the marriage of the Lamb is come, and his wife hath madeherself ready. Let me repeat that: his WIFE hath made HERSELF ready. Will you join me? Either we are ministers of the Gospel or we are hirelings. Which one is it going to be? © 2006 Copyright by Michael K. Lake, Th.D. Dr. Michael K. Lake is the Chancellor and Founder of Biblical Life College and Seminary, the host for Biblical Life TV and the Kingdom Intelligence Briefing Podcast, a contributing author for the best-selling book, Blood on the Altar: The Coming Christian vs. Christian War, and is the author of the best-selling book, The Shinar Directive: Preparing the Way for the Son of Perdition. YES! Thank you so much! I have long felt that somehow we are “:missing the mark” and living in a shadow land. I feel the anxiety as time is running out and we are not ready at all to meet The Bridegroom. I am under conviction to be one of the wise virgins who are prepared, ready and waiting for His appearance, yet wondering how to achieve this objective. I have begun to fast on Thursdays – and gradually becoming away of what and how He desires this to be done. Your ministry is truly a gift. This is an amazing article… Yes I will commit to fast every Thursday with you guys!! Been fasting for a while,now. It is such a blessing! But I’m taking thanksgiving Thursday off.